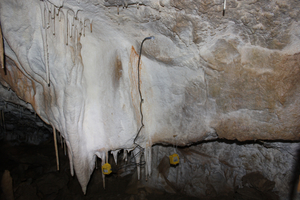 A total of six Tinytag Plus 2 data loggers were used in a study whose final aim is to reconstruct past climate changes recorded by stalagmites from these caves. The team of scientists from the Emil Racoviță Institute of Speleology in Bucharest was led by Dr Virgil Drăgușin. The caves are part of a karst system - a landscape characterised by the presence of caves, potholes, dry valleys and sinkholes, resulting from the corroding effects of slightly acidic groundwater on soluble limestone. Although placed in a harsh environment, where relative humidity is always close to 100%, the Plus 2 TGP-4500 data loggers were able to record variations in cave air and rock temperature as small as a few thousands of a degree Celsius. Analysis of the recorded data showed semi-diurnal cycles in the temperature, with minimum levels both in the late morning and in the evening, while maximum levels were observed during the afternoon and in the early morning. The research investigated if these temperature changes could be caused by earth or atmospheric tides (an effect of the combined gravitational action of the moon and the sun) rather than by the day and night temperature changes of the surface. Advanced statistics helped the team understand that the small temperature variability was induced by atmospheric pressure tides caused by the sun. Further, the team verified if cave air temperature could have also been influenced by moon-produced tidal forces, via rock temperature variations. To this end, another Tinytag Plus 2 TGP-4020 data logger with an external PB-5001 temperature probe was completely buried inside the limestone cave wall. The free space left around the handle was filled with cement to ensure the probe was in direct contact with the rock over its entire surface and isolated from interacting with the cave atmosphere. Results confirmed that semi-diurnal variability seen in cave air was not present in the rock temperature, therefore the team states that the surrounding rock is controlling air temperature on monthly, but not semi-diurnal timescales, and hence there was no reason to consider an influence of lunar tides in the cave air temperature. Dr Virgil Drăgușin notes "We used Tinytags for a long time and are very happy with their reliability for this very specific area of climate research. But during the study described here we were even happier to find them to be more sensitive than what we knew from the product data sheet, allowing us to record the hardly noticeable influence of solar tides on cave temperature. It could well open up new opportunities for using these data loggers in the fields of geodynamics or atmosphere physics." The Team at Tinytag was delighted to be involved with the Project, commenting "Cave monitoring is yet another example of how the Plus 2 range of data loggers is ideally suited for use in harsh or remote locations for long periods if required." A link to the full Project report can be found here.